Menu Popper is a plugin for FileMaker® Pro that shows both dropdown and multi-level pop-up menus anywhere on your FileMaker database layouts. Menus show wherever the user clicked, or they can be aligned with a particular button or other item on your layout. Save space on your layouts by changing a series of buttons into a single button that pops up a menu. Multi-level menu support means any menu item can contain a sub-menu. Menu items chosen can return a value different from what the menu item says, so you can do things like return a customer ID when a customer Name is chosen. 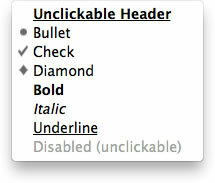 Menu items can be given different types of bullets, bold, italic, underlined, or disabled grey. You can even make non-grey items unclickable to use for things like headers. FileMaker's type-ahead suggestions are limited to matches from the field being typed in. 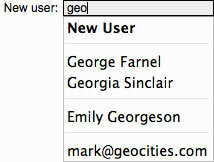 Menu Popper can add a similar dropdown menu below FileMaker fields. As the user types, use your own SQL to fill that menu with suggestions that come from different database fields. You control the order of results. The number. The grouping. You can add menu items that do things like create a new user or populate other fields based on the record id of the chosen match. Use a wide menu to show First name, Last name, Email, Phone, and Workplace from a number of possible matches, speeding data entry as it becomes clear if the person being entered is going to match someone who already exists. Menus are quick and easy to create with a simple string of text. Create menus from values separated by comma, tab, semi-colon, newline, or any other character. Even FileMaker Value Lists can be used. A menu item name of “-“ is converted into a divider between menu items. By showing menus based on SQL queries you can get rid of Table Occurrences that exist soley so FileMaker can generate Value Lists for use with its native menus. You can get rid of extra Value Lists as well. Menus can have items added, removed, or changed in style. You can even combine two menus. Menu items can be set to show only when modifier keys, such as Shift, are held down before the menu is shown. Just like FileMaker dropdown menus, Menu Popper dropdowns respond to up/down arrows, close when Esc is pressed, and even open again when the field is clicked in or first entered. But Menu Popper dropsdowns are fully customizable, showing and returning values you control, in styles you control, and running scripts you control. You'll be amazed how often an extra menu comes in handy. Once you start using them, you'll wonder how you ever did without them. Give it a try - free for 30 days.